You may have noticed its been a big quiet on our little blog in the last few weeks. Well fear not, we haven’t abandoned you! We’ve been busy adding lots of shiny new products to our website! And boy has it been worth it! From balloon dog bookends to dinosaur desk lamps, and from perfect pineapple-shaped accessories to cool copper creations, these stylish products are set to take the world of quirky home accessories by storm! We’ve even added five new exciting brands: Disaster Designs, Temerity Jones, Imm Living, Giggle Beaver and Just Mustard! Check out all of the lovely newness on our New Additions page – plus we’ve picked out our favourite new products below! Add some colour to your shelves with these paw-some pooches from Imm Living! These adorable home accessories take inspiration from the classic animal balloon art which never failed to make us smile as children. But unlike these circus trick critters, these funky bookends won’t deflate any time soon! Treat your desk to a tropical makeover with these quirky pineapple-shaped desk tidies from Just Mustard! They will add a splash of fruity colour to your home office, whilst ensuring that your stationery is kept nice and tidy! These brilliant origami lamps from Disaster Designs will funk up any bedside table! Including all manner of creatures, from cute rabbits to fearsome t-rexs, there is something for everyone! Check out the full range here! This stylish metallic fruit design from Temerity Jones has taken its inspiration from the current pineapple and copper trends, and has merged them to create a stylish and functional household accessory, which will help you cut the coin clutter in your home! 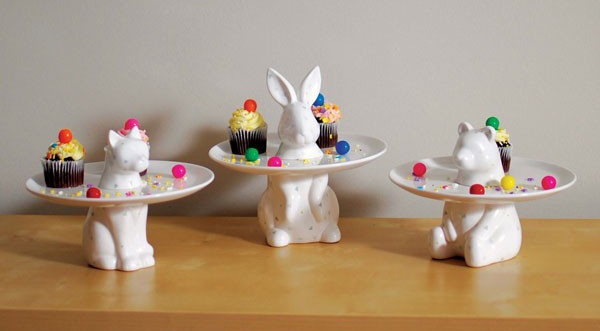 Show off your recent bakes in an adorable way with these animal-themed cake stands! Made from sturdy white porcelain, these funky cake displays add a touch of quirkiness to your proceedings without being over-dominating. Plus, check out our new T-Rex cake plate! Cactus designs are a hot trend for 2016 so we thought we’d get on the bandwagon with this funky pen pot from Just Mustard! It even has a magnetic arm for holding paperclips! This funky creation is available in September – pre-order yours now! This stunning side table set comprises two circular tables – one slightly larger than the other – with black wire frame bases and sleek copper-painted tops. These unusual side tables are a brilliant way to inject some minimalist, industrial flair to your living room, and also hint at the recent copper and metal wire trends! A dash of retro style, a sprinkle of designer expertise, and a splash of stunning functionality and you have the Utility Condiment Picnic Table! Shaped like a picnic bench with a classic Fifties-style umbrella, this funky dining table accessory is a handy holder for condiments. Organise your kitchen in an elegant and chic way with this delightful copper wire storage rack from Present Time! This subtle and sophisticated design can hold all kinds of kitchen accessories – from mugs to tea towels! Vanilla Carnival Lights are a fun and easy way to add some atmospheric style to any room! This wonderful collection includes single letters of the alphabet and and ampersand (&). See all of our wonderful New Additions here! Student Living: making uni digs feel like home!